Alpine is an established American Plan resort tucked away in a beautiful, secluded lakefront setting. Our authentic log cabins stand among towering pines and overlook scenic VanVliet Lake on the Presque Chain. Our American Plan pampers you with meals and maid service. 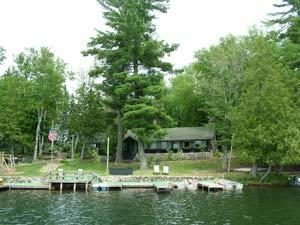 The lake itself is a jewel in the woods, one of three in the spring-fed Presque Isle chain-of-lakes and truly earns its classification as a Class “A” muskie lake.